We don’t have chance to do public sankirtan here in Turkey yet, however we use every chance to distribute Srila Prabhupada’s books. 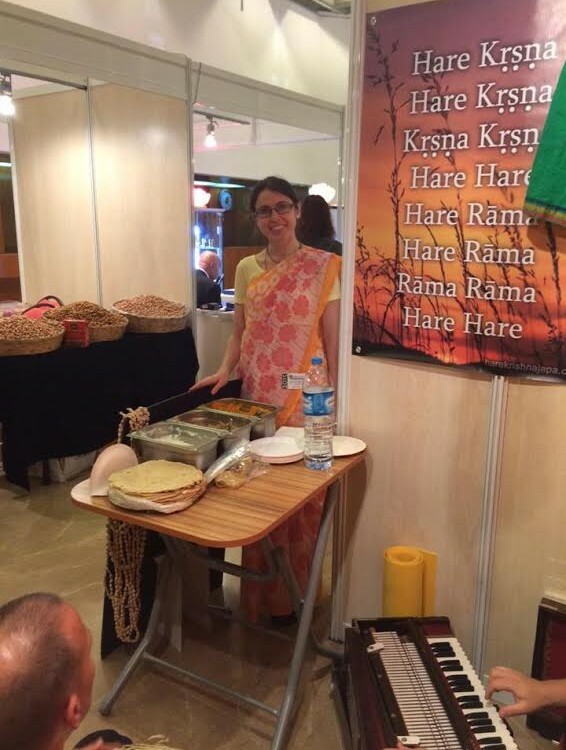 Our Srila Prabhupada Marathon started with an exhibition called Natura Festiva. 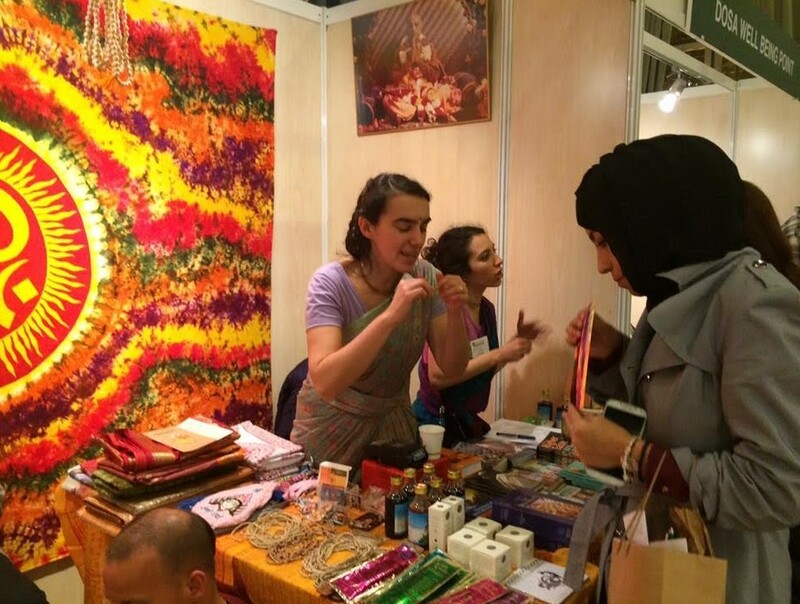 We attended this prestigious Exhibition from 26 to 29 Nov which was held in Istanbul. We had a stand there for 4 days. I must admit that it was the best preaching activity for us in public. The exhibition was opening from 11:00 and lasting till 19:00 every day. We had a 4,50 sqm stand which we decorated with our books and other preaching materials. The best part of this event for our small yatra to see many of our devotees getting different services and involving in direct preaching with Turkish public. In 4 days we sold 63 Srila Prabhupada books, distributed prasadam, got almost 200 e-mails from visitors and thousands of people got darshan of Srila Prabhupada and Hare Krsna Maha Mantra. There was a lot of interest to our stand. Devotees were shining in the exhibition area. Srila Prabhupada ki Jaya! 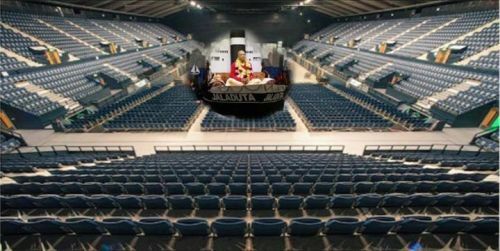 ISKCON 50 Plans Ramp Up in the UK, Worldwide. 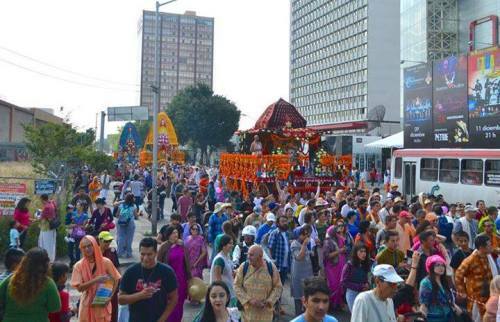 In the UK, an avalanche of major, inspirational events for ISKCON’s 50th anniversary are being planned throughout the year 2016, including some that will be tied into international efforts by all ISKCON temples. ISKCON 50 reps at the 13 temples across the UK and Ireland have already held several events in 2015 in honor of the 50th anniversary of Srila Prabhupada’s arrival in the US on the steamship Jaladuta. They included a “Departing India” festival in which a book of Srila Prabhupada’s Markine Bhagavata Dharma poem written abord the Jaladuta was released; a Bhaktivedanta Players production about Prabhupada’s journey; and a kirtan tour of London’s most famous landmarks on open air double-decker buses with hundreds of devotees. Small children are completely dependent upon their mother’s care, who is always attentive to their every need, in every way, all the time. Many children of Srila Prabhupada’s disciples were obliged to make a great sacrifice when they were very young. These children were asked to give up there mother’s constant loving care, for the benefit of the suffering conditioned souls in the world. Their mother’s were soldiers in Lord Caitanya’s army. Some were book distributors on the front lines of a great war against the material energy. Others were part of the intricate network that fueled, supported, and maintained the desire of Srila Prabhupada, to flood the earth with transcendental knowledge in the form of his books. Srila Prabhpada was the orchestrator of the greatest Brihat Mrdanga ever sounded. It’s tumultuous calls awakened the fortunate, to the opportunity of perfecting their lives. These blessed children have now grown up, passing through severe battles of Maya’s attacks. Many of them have been wounded or permanently scarred. But most of them now walk through life with a treasure rarely possessed by anyone else in this world. 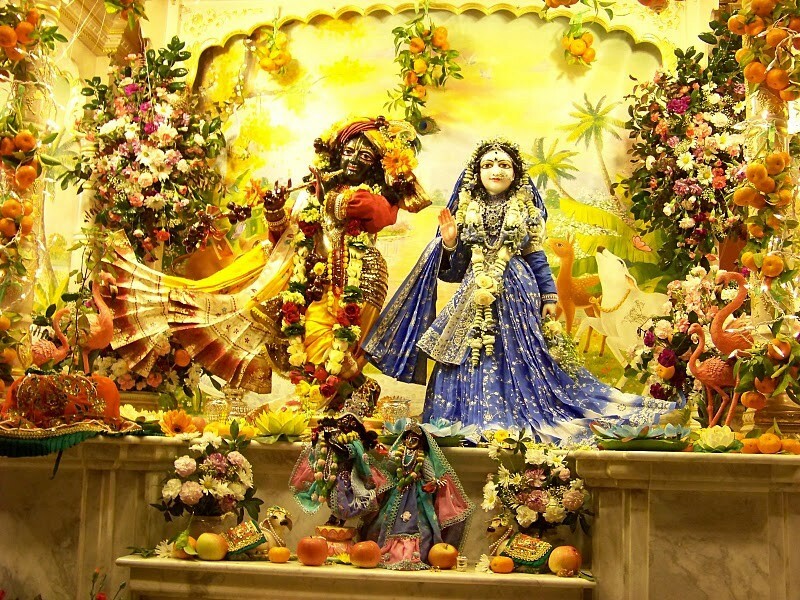 Through all their years of painfully growing and trying to understand the unique circumstances their births, a deep love and faith in Srila Prabhupada has blossomed. 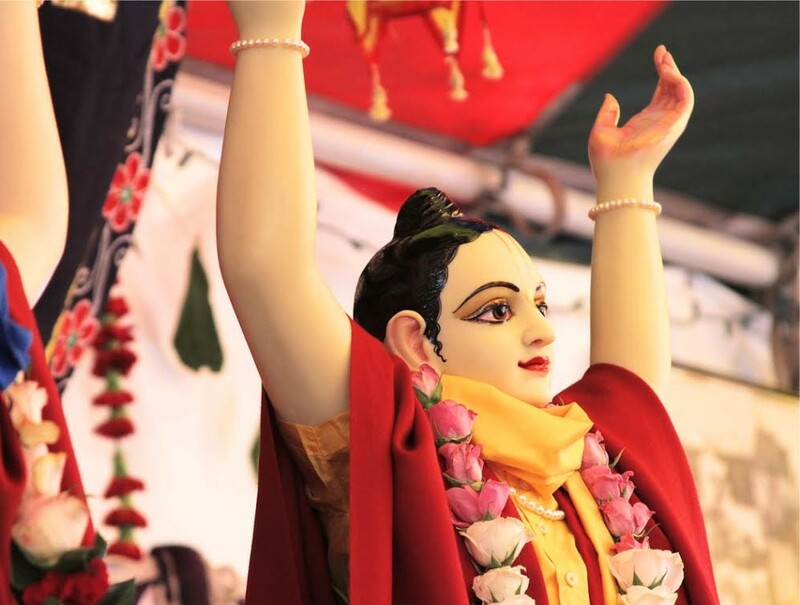 In Alachua Florida, a remote place far away from the Sri dhama Mayapur, these beloved grandchildren and great-grandchildren of Srila Prabhupada, performed a yajna for the pleasure of the Lord and the welfare of all living entities. Through the strength of Srila Prabhupada’s love, they bonded together to execute a great sacrifice, “The Festival of the Holy Name’’. As the names of Krsna burst forth into song from the enraptured hearts of the devotees the transcendental sound vibration could be heard up to the heavens. Thank-you to all who conceived of, organized and participated in this great yajna. You demonstrated to the world the glories of the Sankirtan Movement, by absorbing yourselves fully and using the precious gift you were given. You have made you lives successful by taking full shelter of Srila Prabhupada’s love. Thus, you have made our lives successful. Thank-you our darling children. May you continue to perform the Yuga Dharma with determination, taking nourishment from Srila Prahbupada’s transcendental love, of which you are the rightful heirs. For you have made it clear to the world that Srila Prabhupada is always with you. I tried my best to help my own mother in spiritual life. Unfortunately, throughout most of her life she never showed the slightest interest in religion. Whenever I visited her we would often debate the existence of the soul, life after death, karma, and similar topics. Throughout the years I continued cultivating that little “something” in her heart by sending her Srila Prabhupada’s books, which invariably ended up in a pile at the back of her garage collecting grease and dust. A few years ago she telephoned me late one night. It was an unusual hour to call, and I was surprised to hear from her. She began the conversation by asking if I would take her to Vrndavana, India. But she insisted and wanted to know when we could go. Although intrigued at the prospect of taking my mother to Vrndavana, because it was late (and I was very tired) I told her I’d call her back early the next morning and we could discuss the matter in detail. I woke up refreshed the next day, and after my shower excitedly dialed her phone number. My brother answered. There was a prolonged silence, and I sensed something was wrong. Collecting myself, I said, “Cancer! He replied, “When Mom learned she had cancer and was going to die, a strange transformation came over her. She became restless and unsettled. She began asking about you, wanting to know where you were and what you were doing. She had an intense desire to meet with you, to speak with you. “One morning I went out to the garage to empty the garbage, and I found her going through all those books you had sent her during the past twenty-five years. She looked up at me and asked me to carry them into the house. That afternoon she carefully dusted them off. For the last five months she just sat in her rocking chair reading those books. Sometimes she’d underline a certain passage or quote that had particular relevance or importance to her. She also contacted your tape ministry in London and ordered all your lecture tapes. She’d listen to them on her headphones, rocking back and forth in her armchair, looking at your picture, which she kept on the table nearby. She must have listened to at least three a day. “Gradually her condition deteriorated, but she wasn’t afraid. I think there was something in those books that made her fearless. Then last night she sensed she was going to die. She told me to call you. I put the phone down and cried not out of mundane sentiment or attachment, but in appreciation that my spiritual master, Srila Prabhupada, had extended his mercy to my mother and delivered her from material existence. I went home for the memorial service and arranged her estate. Just before I was leaving to return to Europe, my brother and sister approached me and asked what they should do with her ashes. Remembering my last conversation with her (that she desired to go to Vrindavan), I smiled and took the ashes with me. Several weeks later one of my disciples placed them in the sacred waters of the Yamuna River in Vrndavana, India. I had fulfilled my mother’s last request to me, a request that l pray, will also be on my lips the day I leave this world. The book “Free To Preach” Is finally out! 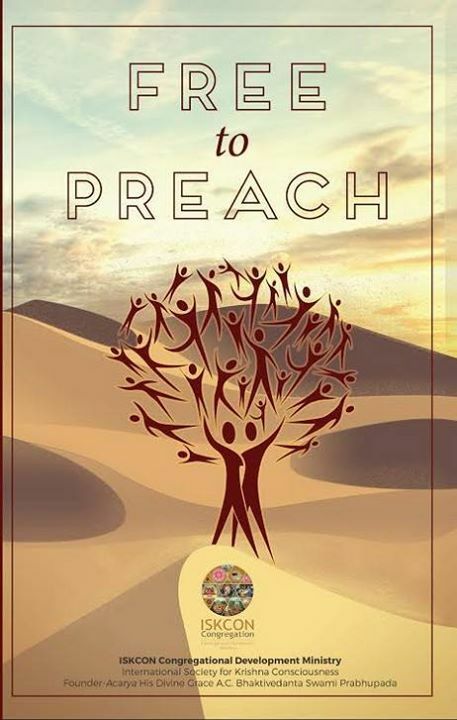 Thanks to all the donations and contributions from many devotees who have so graciously assisted us in our service, “Free to Preach” is finally off the printing press and ready to be delivered to your homes. This book, by Prema Padmini devi dasi, is a touching and personal account of a grihastha couple spreading Krishna consciousness in a Muslim country in the Middle East. It is destined to both fascinate minds and touch the hearts of hundreds.